Our subtlety scented or unscented hand and lip balms are made with beeswax from our own hives and other natural ingredients. 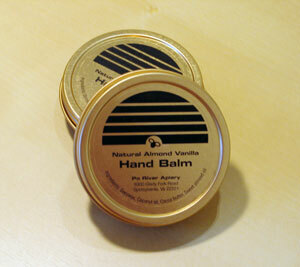 Hand balms come in 2 oz. gold screw top tins. 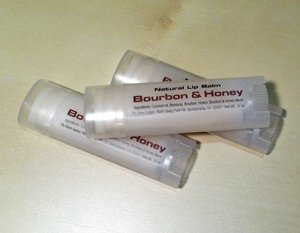 Lip balms come in .15 oz. oval tubes. Made with beeswax, coconut oil, cocoa butter, and almond oil. 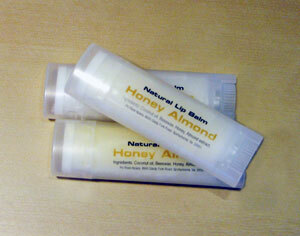 lightly scented with pure vanilla and almond extracts. Made with beeswax, coconut oil, a blend of A. Smith Bowman Distillery bourbons, ​bourbon & honey flavoring oils, and honey. 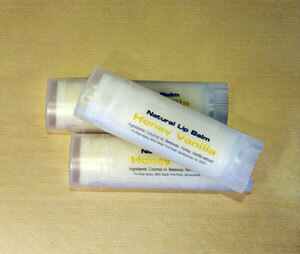 Made with beeswax, coconut oil, honey and pure vanilla extract. Made with beeswax, coconut oil, honey and almond extract. 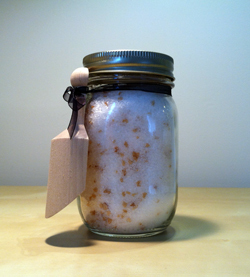 Made with beeswax, coconut oil, honey, and a hint of peppermint oil. 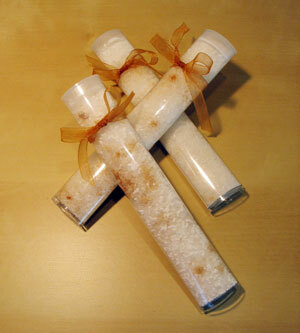 Our bath salts are made with Ceara sea salt, epsom salt, and crystalized honey, it has no added fragrance. One pint jar with a wooden scoop. I met you a month or so ago at the farmers market in Fredericksburg. You gave me a tin of your mustache wax and asked me to give you some feedback. Since then I've used your product almost every single day and I can say with confidence that it is the best mustache wax I've used. 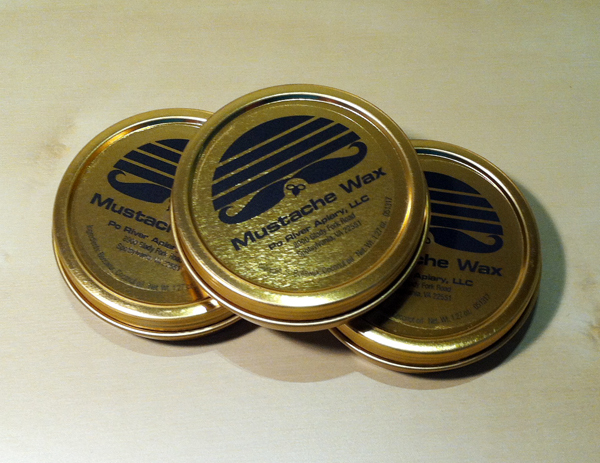 Every other mustache wax I own has gone completely neglected, because I'd rather use yours 9 times out of 10. Scent: At first I was skeptical about unscented mustache wax because I've only ever used scented waxes, but it has become the thing I like most about it. I make my own beard oil in a variety of scents and rotate them out. The fact that your mustache wax is unscented means that I can use it in conjunction with any of my beard oils or beard balms and never have to worry about it clashing. Hardness: you perfectly nailed the ratio of wax to oils, at least for how I use mustache wax. This is a bit personal as some people prefer a more styled mustache than I do, but I've found that your wax is hard enough to give my mustache some shape and keep it out of my mouth all day, and soft enough that it looks natural and un-styled. Size and price: I don't think I will EVER run out of this mustache wax. I've been using it every day for over a month and haven't even made a dent. To put it in perspective, I use about half a thumbnail tip's worth of wax, barely enough to rub between my two index fingers. At this rate I think I could keep using the tin you gave me for the next decade. Every other mustache wax I own either comes in a tin the size of a quarter or in a chapstick tube. The tin you're using is more typical for a beard balm. Now, I should probably file this under the category of "things you could change," but I don't really want to because it makes me extremely happy that I don't have to worry about running out of this amazing mustache wax. Half of the reason it's taken me so long to write this email is that I haven't been able to come up with any worthwhile constructive criticism. I've tried making my own mustache wax in the past and gave up because I couldn't get it to the consistency I wanted: your wax's consistency. Form factor: as I mentioned above, the tin you're using is atypical for mustache wax. If you're going to change this let me just explain the merits of the different form factors. Tins are nice because they give you control over how soft to make the wax, you can work it together with your fingers a little or a lot and get a different styling effect; but, they're a little more tedious to apply. Chapstick tubes are extremely convenient to use, two quick wipes and a comb and you're done; but, you don't have the ability to soften the wax in your fingers so you're limited in styling and occasionally you'll get a chunk of unmelted wax stuck in your mustache. Other products: you've already perfected what I think is the hardest beard product to make. You could branch out and try to make a beard balm (which is a much much more oily and soft mustache wax, meant to be rubbed into your face and through the entire beard) and beard oil (same principle as beard balm, but completely liquid) and then you'd have a full product line. In my daily routine I use beard oil to moisturize my face and condition my beard, beard balm to style if I'm having a bad beard day, and mustache wax. 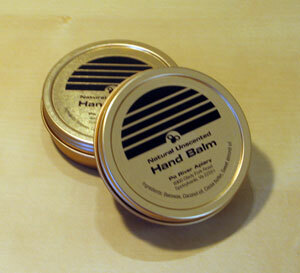 Beard balm varies pretty widely in its hardness. The softer it is the better it is as a moisturizer/conditioner and the harder it is the better it is as a styler. Most are softer, but I strongly prefer a harder beard balm because beard oil is hands down better at moisturizing and conditioning. When I use a beard balm I want hardness for styling and control. Scent: again, as I mentioned above, I think your mustache wax is perfect as is and doesn't need a scent. However, if you do branch out into beard oils and beard balms AND shrink down the size of your mustache wax packaging, then it wouldn't be a bad idea to have a scented wax to match the scented oil and balm. Just like when you're cooking and you season as you go to build the flavor up from the start, layering the same (or a complimentary) scent in different grooming products makes for a better and longer lasting effect. So, to sum up, I love your mustache wax. I hope my feedback has been helpful, and if you have any questions about anything beard related feel free to ask.